Our floors are finished and they are fabulous. 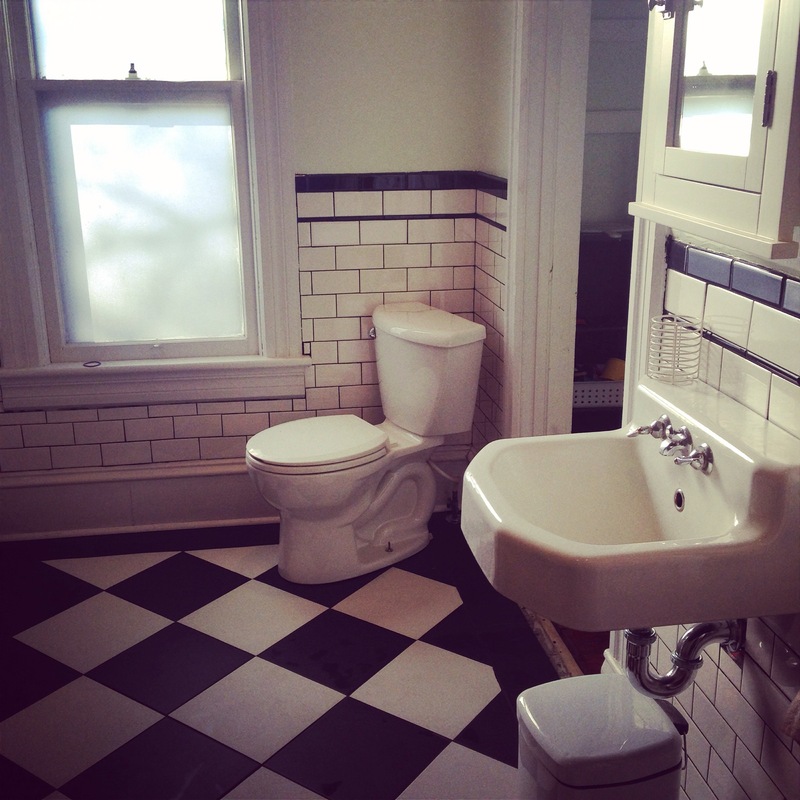 I love the vintage hexagonal tile, but because our bathroom is rather large, that’s a lot of grout lines to keep clean, and at $5-$6/ square foot, was more than we were hoping to spend. I really didn’t want to do a modern- look… any modern tile that I would like would either not fit the era of the house, or be way too expensive. After a little head-scratching, it hit me: a checkerboard floor. It also allowed us to use generic, solid black and white, 12″ tile, which we ordered from the American Olean “Urban Tones” collection from Lowes for $3.47/ sq foot. We paid $400 in tile. The other thing we treated ourselves to was to heat the tile. The bathroom has 3 exterior walls and is super cold during our long winters. We knew that even thought it would be a bit of a splurge, it was a luxury that we would really appreciate on a daily basis. We were able to order the heat coils online at 60% off, and paid about $500. So if you factor in grout and mortar, the floor cost ~$1000. We also installed electric in-floor heat when we did our bathroom. After living with it now, I wouldn’t tile a bathroom without it. So nice not to step on cold tile with bare feet!